As the Energy Team, our goal is to create and implement the systems that generate, store, and distribute the energy powering Tiny House. This will require three main generation sources: a solar energy system (mechanical and electrical), a portable wind turbine (see prototype below), and an energy bike. 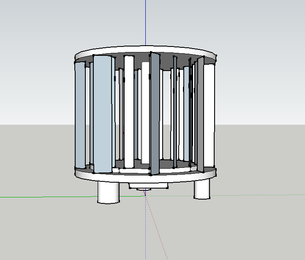 Possible vertical-axis wind turbine design, courtesy Miguel Trujillo. Solar power will be the main source of energy for our project, and it will be found on the roof of Tiny House. We aim to develop a solar tracking system, using a small computer and sensing equipment, as well as a solar panel mounting system that allows for axial movement and storage of the panels. We will also design a small, efficient wind turbine that is stored easily and can be used as an alternate energy supplier. Finally, we will construct an exercise bike to be used as an emergency back-up energy source. Our energy will be stored in a battery bank created from second-life batteries of Electric Vehicles (using technology from the Battery Bank ESW group! ), and the power will be distributed and stored depending on priority of energy usage. Currently, we are in the research & design stage of all three energy sources. Thanks to UCSD's TGIF grants, we've just received a total of almost $2,000 to finance our projects! Designing is in process.